Thinking of taking your dog on holiday? Every year thousands of dogs join their families and travel by ferry for a holiday. Most crossings require your dog to remain in your vehicle or one of the ferry’s kennels and we have teamed up with the RSPCA to help make sure that wherever your dog spends his or her time, their experience is a positive and enjoyable one. Be aware that leaving your dog in a vehicle can lead to heat stroke and in some cases, can be fatal. Some types of dog are more prone to heatstroke, like very old or young dogs, dogs with thick, heavy coats or dogs with very short flat faces like pugs and bulldog types. Dogs with certain diseases or on some types of medication are also more at risk. This risk can be avoided by never travelling on hot days and always at the coolest part of the day. For example, travel overnight or leave first thing in the morning or later at night. We strongly recommend to customers to visit their vet before travel for a pet health check to ensure the pet is in fit condition especially if your dog is one which is more prone to heat stroke. 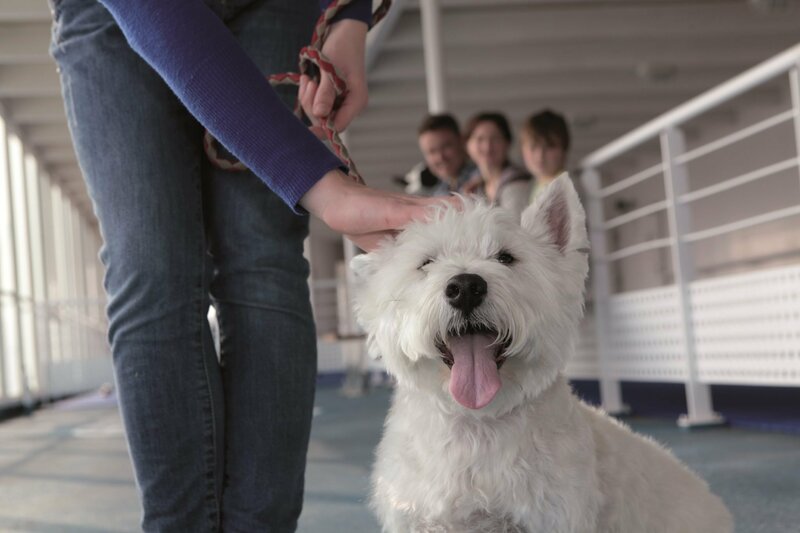 Bear in mind that, unless you are travelling on a ship with pet-friendly cabins and you have booked one, your dog will spend most of the time at sea on his own. It may be possible to arrange to visit your car mid-voyage to check on your dog – the car deck is not accessible to passengers once the ship has sailed so you would need to be escorted, so visits depend on the availability and discretion of the crew – but it is highly unlikely that he will be allowed to leave your vehicle. You therefore need to prepare in such a way which ensures he is comfortable and happy during the journey. Make sure that the area in the vehicle in which you transport and intend to leave your pet is comfortable and secure. Your dog will need plenty of space during the journey and when left in the vehicle. Whether unconfined or in a crate he or she will need to be able to sit and stand up at full height, turn around easily and lie down in a natural position, and must not be able to escape. Take some absorbent bedding to help him/her feel comfortable whether left in your vehicle or taken to an on board kennel. As your dog is highly unlikely to be able to leave the vehicle once sailing, this can help if your dog has any accidents during the journey. Having familiar items near him/her can help make them feel more comfortable, e.g. your dogs favourite toys. ched to the side of a travelling crate or left on the floor of the vehicle. As your dog has to remain in the vehicle during the crossing, your dog will need an opportunity to go to the toilet prior to getting onto the ferry so give yourself enough time to get him/her out of the car. If you are leaving your dog in your vehicle rather than in a kennel, make sure there is enough ventilation for your pet. Creating a flow of fresh air can be helped by opening both the driver and passenger’s front windows. Take care to ensure that your dog cannot escape from their carrier or your vehicle. Some ferry companies may provide window grilles which helps with ventilation and avoids escape but not all so we would advise taking your own. If you are taking your dog to an onboard kennel, make sure you take some bedding so that he/she is comfortable. Make sure your dog’s water container is full with clean fresh water and accessible to him throughout the ferry crossing. If you are concerned about your dog at any point during the crossing then please do speak to a member of staff who may be able to accompany you to your vehicle or the kennels. Be aware however that increased security concerns may impact on whether or not this is possible. Once you have left the ferry, find somewhere safe to pull over and get your dog out of the car. This will allow you to check him over and an opportunity for him to go to the toilet and stretch his legs.